Thanks for putting in so much time updating your great addons. 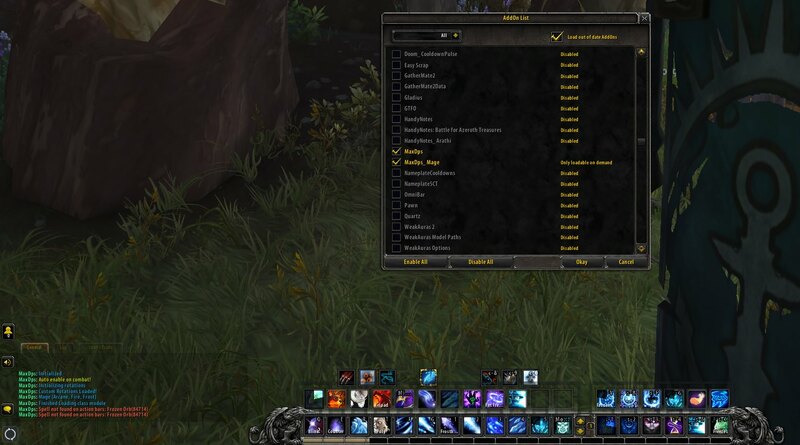 I've been trying to troubleshoot the Frost Mage maxdps rotation but I think I hit a wall. "MaxDps: Spell not found on action bars: Frozen Orb(84714)"
I have tried binding a frozen orb to every action bar (1-6). I have also created a Frozen Orb macro that is called Frozen Orb and shows the Frozen Orb tooltip. The addon doesn''t seem to be detecting the skill so it just gets stuck when entering combat. If I cast a Frozen Orb then the rotation gets unstuck and starts working again since it's no longer looking for that ability. Let me guess, you have pvp talent that changes frozen orb to work differently? Firstly thank you for all the work you put into this for the users. I greatly appreciate all that you do. I wanted to add to MageTings post on the same issue. I have followed each step you listed and compared my findings to Mage Tings. AND YES, after replacing "Concentrated Coolness" Frozen Orb started showing up in the rotation with no error code present. I will probably push support for this soon. So i have the same Bug with Forzen Orb, i also use the PVP Talent. Just wanted to say that it would still need attentiion. I enabled Alpha Versions to download, got everything installed (Every Class Modul and Base Add On) reinstalled everything etc. etc. and still the Errors accur. "Spell not found on action bars: Frozen orb (84714)"
"Spell not found on action bars: Ebonbolt (257537)"